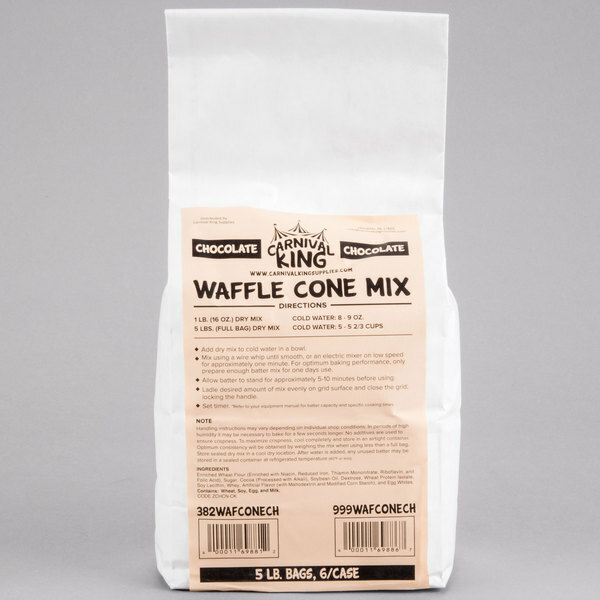 Easily make your own waffle cones with this Carnival King chocolate waffle cone mix! 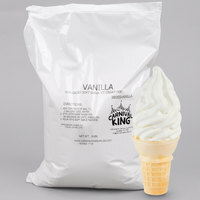 Carnival King is dedicated to serving each patron like royalty with light and flaky waffle cones made from this premium mix. Chocolate waffle cones have a timeless appeal with a dark brown color and sweet, cocoa taste. Fill your waffle cones with scoops of ice cream for the ultimate summer treat, and watch as lines begin to form at your carnival cart, concession stand, or ice cream parlor. 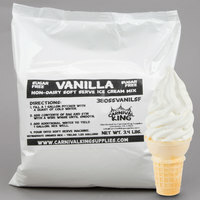 "The best cone mix I have found for our ice cream and frozen yogurt. Quick and easy to make! Just add water and ready to make!" 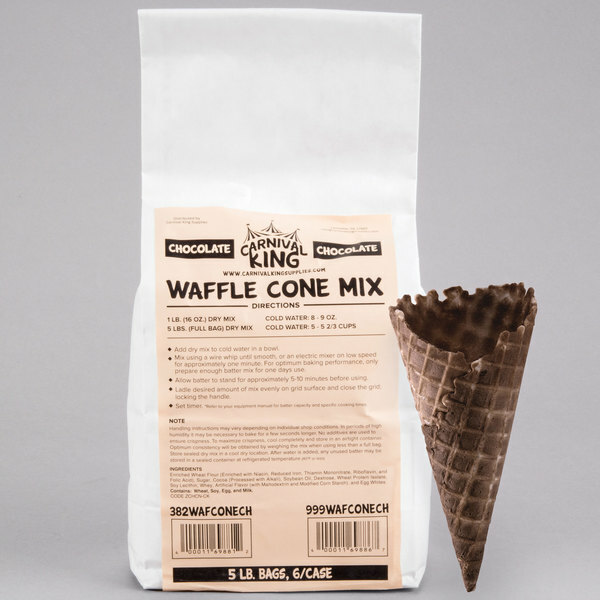 Rather than risking breakage and damage from pre-packaged or store-bought waffle cones, Carnival King's chocolate waffle cone mix allows you to prepare and serve your own waffle cones right when you need them. They'll have a fresh, homemade-style appeal that your customers crave. 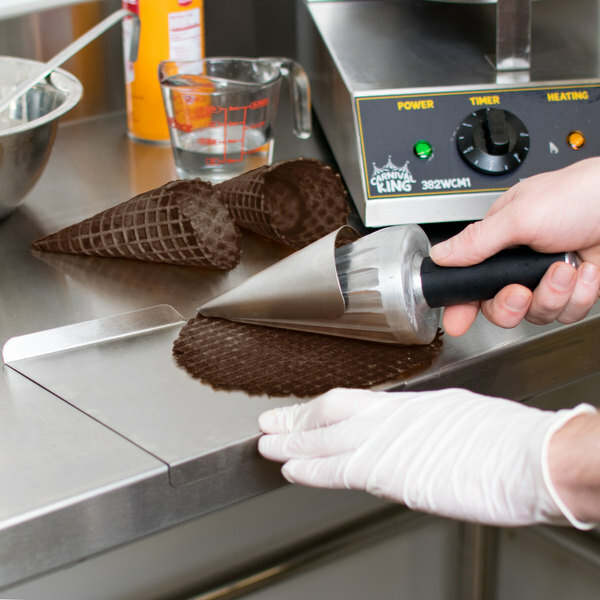 Upgrade your ice cream supplies, and offer fresh-made, chocolate waffle cones as an appealing alternative to standard cake cones or plastic dishes. 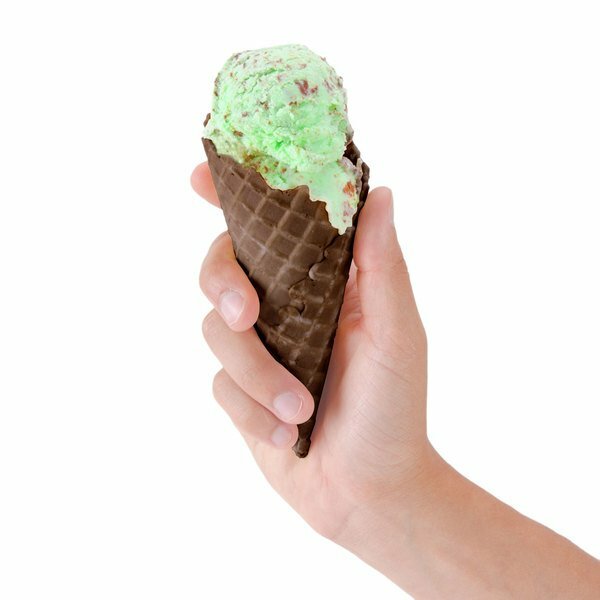 Waffle cones enhance the aroma and taste of your ice cream servings - not to mention that their unmatched appearance boosts impulse sales, too! Increase profits at your ice cream shop by creating your own waffle cone with Carnival King's waffle cone maker. 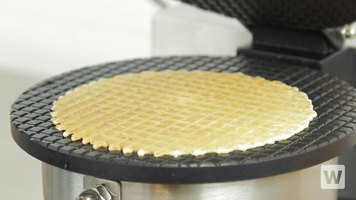 Thanks to the 8” diameter non-stick grids, you can produce up to 40 waffle cones per hour! Increase profits at your ice cream shop and create your own waffle cones with the Carnival King waffle cone maker! With its 8” diameter non-stick grids, this unit provides ample cooking space, and can produce up to 40 waffle cones per hour. 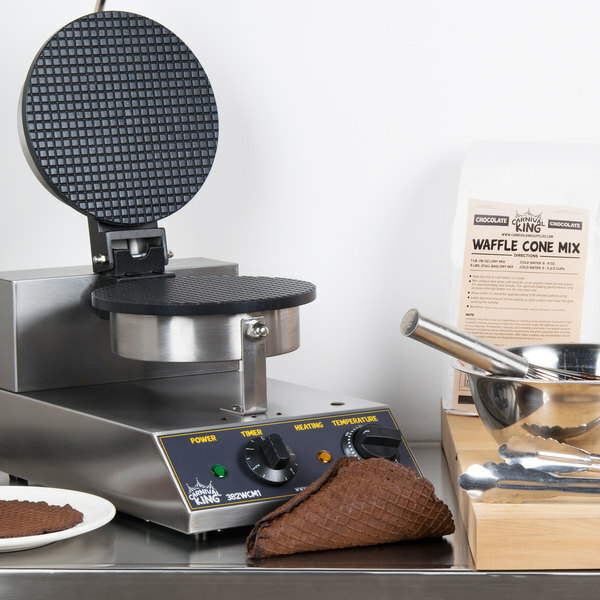 This waffle cone maker has an adjustable thermostat from 120 to 570 degrees Fahrenheit for versatility. A green light shines when the unit is turned on, and an orange light indicates that the unit reaches the perfect cooking temperature. You’ll easily be able to tell when the waffle cones are done with the unit’s audible timer. The Carnival King waffle cone maker is CE Listed and requires a 120V, 1000W electrical connection. Make perfectly-shaped waffle cones for your ice cream parlor or concession stand by following these easy steps! 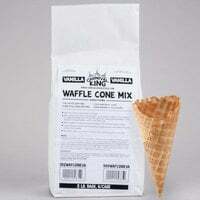 First, you must measure out your Carnival King waffle cone mix and add cold water. Combine 1 lb. of mix to every 8 oz. of water. Then, whisk until the batter is smooth and let it rest for 5 to 10 minutes. During this time, you can turn on and heat your waffle maker. Once the batter has rested, add a scoop to the waffle maker and press until it is softly cooked. 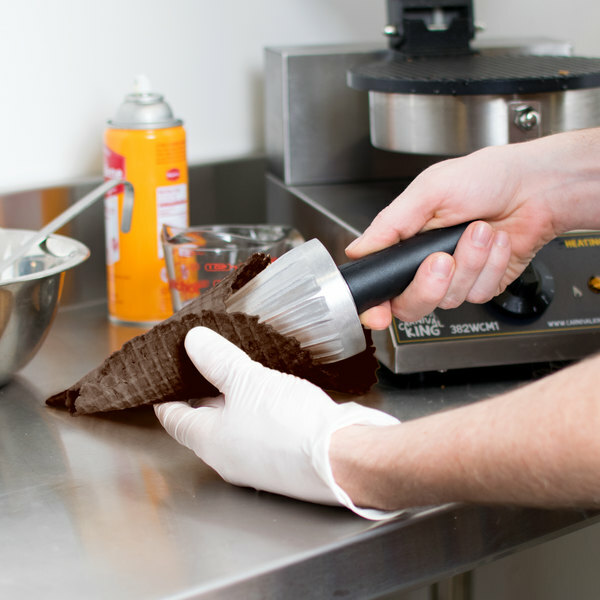 Then, use your waffle cone forming tool to roll it into a professional-looking cone. Let it harden, add ice cream, and serve! Our kids love the change up from the usual Vanilla and old fashioned waffle cones. These have just the right perfect chocolatey taste without it tasting artificial! Makes the BEST Chocolate Waffle Cones! Flavor is rich and they taste like the crunchy part of a chocolate brownie. These are a customer Favorite! 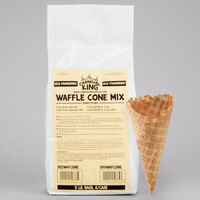 The Carnival King waffle cone mix has been the best buy! The price in unbeatable, the quality and taste are great. We make our own cones for our ice cream shop and the customers really love the cones. Would recommend it to everyone! Great to just snack on too! I bought this along with the waffle maker to make waffle cones and tacos for my company. The chocolate is a bit bland, not too bad but I want to learn other recipes to add to it. Our customers read about these cones! They are very chocolatey without being overly sweet. The smell of these waffle cones fills up or shop. We couldn’t be happier! 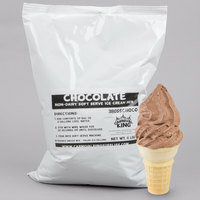 The carnival king chocolate waffle cone mix is great and a great variation on the original. The chocolate flavor is superb and really a hit. 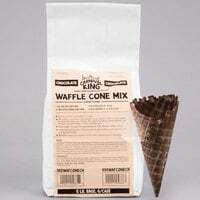 A great flavored waffle cone mix that is a crowd flavored. Everyone loves the rich chocolate flavor of this waffle cone mix. A great way to make in house cones. 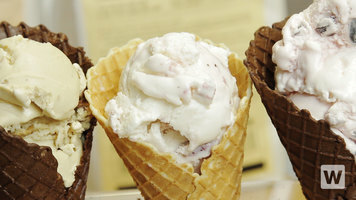 The chocolate waffle cone mix is easy to use and makes a great tasting cone. The cones turn out crisp and tasty and is wonderful with vanilla ice cream. A great variation to the original waffle cone by flavoring it with chocolate. The chocolate mix cooks up great and taste wonderful. Our customers love them. Our customers love the taste of these chocolate walffe cones. 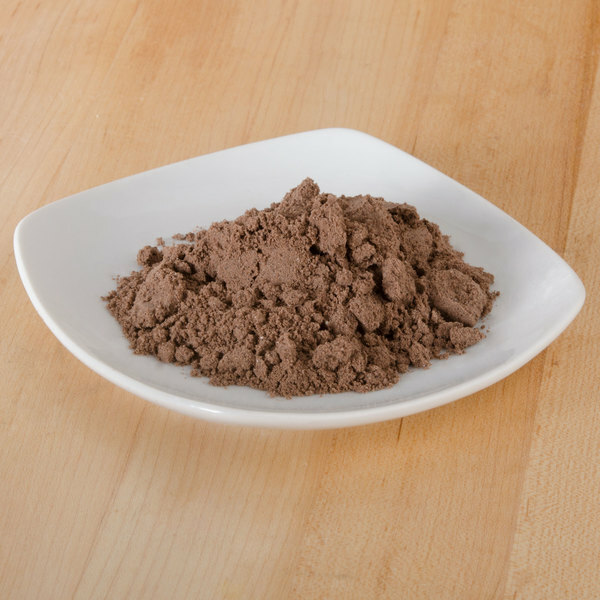 A batter mix that is easy to prepare. Made fresh daily has increased our sales and acquired new customers. I gave this mix 3 stars because the waffle cones broke often. They seemed to come out brittle no matter how we changed the consistency of the batter or thickness of the prepared cone. Taste is great though. We appreciate your review, David. For a softer cone we recommend you cooking your waffle cones for a shorter time. Ooh, yummy chocolate waffle cones, these are so very good. The mix is extremely easy to use and the final product is well worth it. Tried this chocolate waffle cone mix today! It was so delicious and this alone will make my ice cream shop stand out as no one around here offers this. We got the chocolate waffle cone mix today and have already put it to the test! Not only can you make waffle cones, but you can also make waffle bowls with the mix. We are so pleased to have this as part of our pantry and the kids are ecstatic! The best cone mix I have found for our ice cream and frozen yogurt. Quick and easy to make! Just add water and ready to make! Really happy to find this product. Gives you a little something different than your average waffle cone or chocolate dipped waffle cone. Presentation is ridiculous when served with raspberry or blackberry ice cream. Tastes great, and they smell like brownies when you're cooking them. Which is a very good thing. They behave a little differently than your classic cones. I don't normally have to use a nonstick spray with the old fashioned cones but found that these needed it. Tiny learning curve. Well worth it. Waffle cones are the top selling cones used at the store. some customers enjoy the taste of chocolate and what better way to have ice cream that complimenting it with some vanilla flavored ice cream.